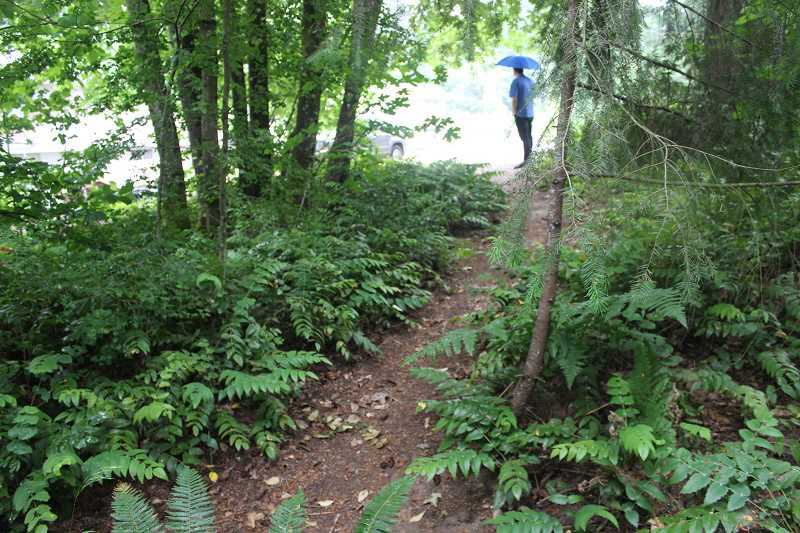 group is advocating for the City of Portland to designate a trail along 30th Avenue that meanders through trees and other shrubbery and alongside homes to be improved and designated a Safe Route to School. It would allow kids to travel from Wilbard Street to Maricara Street without navigating traffic and then walk a few blocks up Maricara Street to Jackson Middle School. "If we did it from our house, she (her daughter) wouldn't have to interact with that four-way stop (at 35th and Huber)," Jackson Middle School parent Miriam Hajj said. "It would make that (the walk) a lot safer, I think." The idea to push the City to greenlight the Safe Route to School was proposed and voted on by MNA members; their goal is to establish the route by the beginning of the 2018-19 school year, though they acknowledge that it could take much longer than that. "The parents in the neighborhood have asked the neighborhood association to establish this Safe Route to School and apply for a permit to build it," Herron said. "As president, I'm doing what I was asked to do." The proposed route, which is currently an unimproved right-of-way, would be 40- to 50-feet wide. Establishing the route would require approval from the City of Portland and may require approval from homeowners who live along the route or consensus support from nearby homeowners. The MNA has not yet gotten all homeowners on board. "We've tried to get the people along the right-of-way to agree to it, but they just don't want to see the change," Herron said. "It depends on what formula they're (the City of Portland) going to ask us to use to make a determination as to whether or not this is a go." However, MNA representatives did meet with City of Portland officials recently and received favorable responses. "We got a very positive response from them. They're willing to go forward with it. Everything is still in the application process," MNA member Eric Levake said. "So they told us that could mean it's a few months to a couple of years. It's hard to say exactly what time frame we can look at this with. That was very encouraging." If the route is approved, Herron said the MNA would pay for the costs to improve the trail — which would mean spreading gravel, removing invasive species and other plants, and landscaping — via donations and fundraising events, and that such work would only take a couple of weekends to complete. "It doesn't cost the taxpayer a dime. This is all in the neighborhood. This is selffunded," MNA Vice President Kim Herron said. It would also absolve adjacent homeowners of liability in case of injury. The City of Portland would be exposed to liability instead. "You have to take the long view, look at the greater good and realize that once it's built it will be used for years and years," Kim said. Hajj has trained her daughter to make eye contact with drivers and be a cautious pedestrian, and she is confident her daughter can navigate the walk to school now. But she said walking on streets that aren't aptly designed for pedestrians creates inherent risk. "It's tricky because distracted drivers and drivers in a hurry are not exactly looking for pedestrians," Hajj said.